Kevin at Exceptional Delaware has already done a review of the 76 page report released today…. It is the official US Department of Education’s own assessment of its own program: Race To The Top. One should expect a glowing endorsement. But even though that would be the normal expectation, that is not what was gotten… Of course, omissions were there as well. Let’s begin with the total Race To The Top number.. $4.3 billion…. That stretched out is $4,300,000,000 or roughly 1% of the USA’s non military discretionary budget for one year. Of that, Delaware got $119,000,000 of that wicked amount of money or in percent….. 2.7% . What did we get? Graph courtesy of US Dept of Ed. 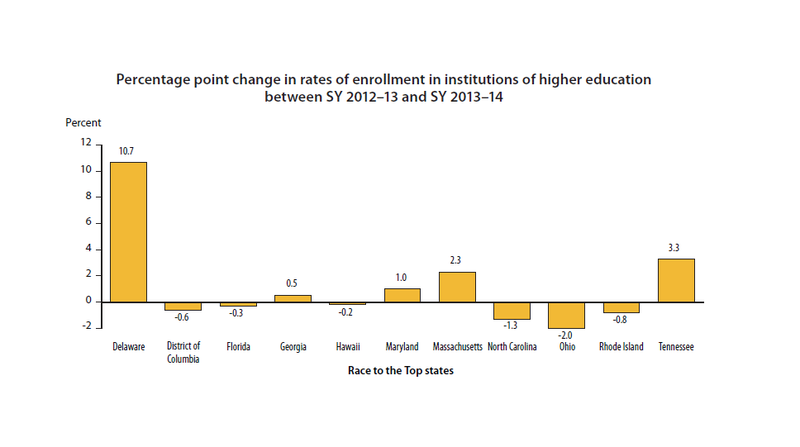 Delaware also got an increase in AP scores…. Isn’t this a lie? We know that some task forces were created but we also know they were handpicked so only those who previously registered support of Common Core (long before its details were made public) were allowed to be on those panels and even then, their recommendations were completely ignored. If anyone can prove this is not so, please respond in the comments below. Whether inclusive or exclusive of RTTT funding, independent sources outside the US Dept of Education has reported that spending per child increased in our state by $475 during the RTTT window…. 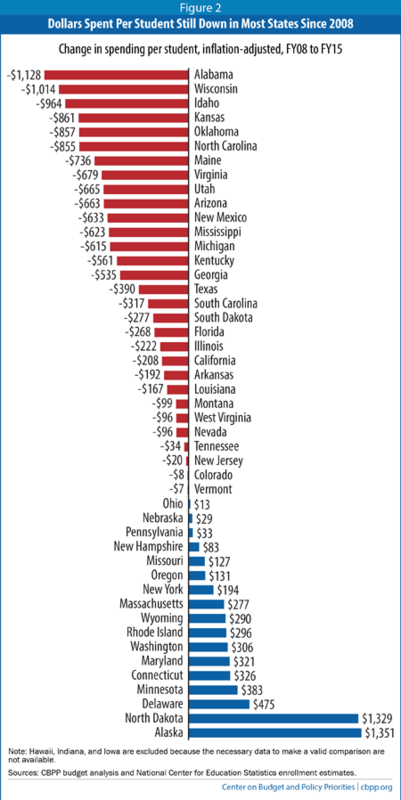 This is in comparison to 4 other states which had not brought per student spending even up to pre-recession levels. Of those RTTT state increasing, Delaware was at the top. But the report leaves out, or only touches on briefly, several controversial issues where states stumbled or backtracked. That’s especially true with respect to teacher evaluations and policies linked to the Common Core State Standards, especially assessments. 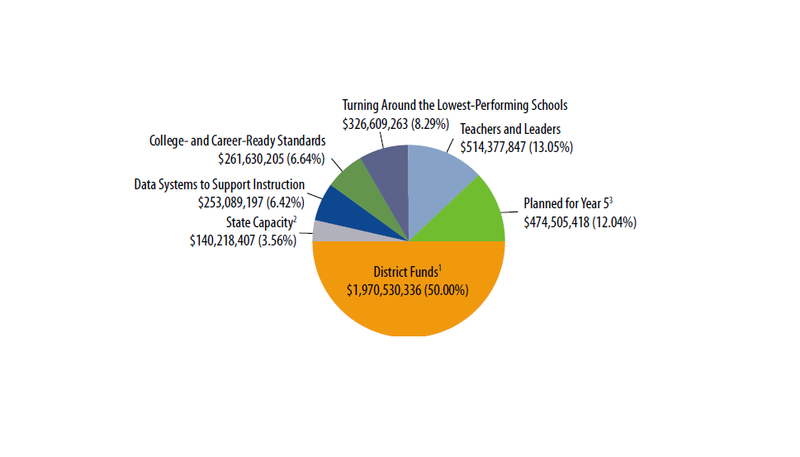 The report seemed to focus less on measurable improvement and more on the new relationships the grants have helped to create between teachers, administrators, and others, and how the grants have refined and enhanced their energy. Translated into corporate speak that is the equivalent of a CEO requesting down the pipeline if we had achieved his goals for the quarter, only to receive the answer that “no we haven’t but we have good news! Nadine in insurance is dating Jonathan in Finance, which means they are talking to each other a lot,” and expecting that to assuage the expected bosses ire. BUT WHAT WERE THOSE UNINTENDED CONSEQUENCES AND HOW SERIOUSLY HAVE THEY DAMAGED AMERICAN EDUCATION? All of the Race to the Top states struggled with teacher evaluations that took into account student outcomes. Many experienced serious political blowback to the standards, in some cases causing major consequences for state leaders. Plus, indicators of student achievement in the report don’t paint a uniformly glowing portrait. Duncan himself acknowledged in his remarks that declining scores on the National Assessment of Educational Progress aren’t encouraging….. Shifting to new tests to measure students’ grasp of the common core has been difficult. That huge issue is ignored in this report… Instead highlights of cooperation between teachers in different states are expounded. It is like praising the recruitment and training of little boys to fight Russian tanks while ignoring the total collapse of Berlin and the Third Reich. The newest NAEP results represent Berlin in that scenario. Today three Race to the Top states—New York, North Carolina, and Tennessee—are formally reviewing the standards as required by their General Assemblies. Florida and Georgia also made changes to their common core, (Plus a large number of non-RTTT states have ditched or drastically modified Common Core from its original perception.) No mention in the report, of course. Unmentioned as well, was the damage RTTT did to top state chiefs… The exalted “chiefs for change” got changed out… It might have gotten hottest for former Tennessee chief Kevin Huffman, who left his post nearly a year ago. But it also made life difficult for John Barge, who is no longer Georgia’s chief. Delaware’s Mark Murphy mysteriously resigned in the middle of a gigantic all-encompassing state-wide controversy over the right of parents to opt out and not have their schools punished by doing so, and Rhode Island’s former head, Debbie Gist, has downshifted to being in charge of a single district of Tulsa’s school system. Only two Race to the Top states (Massachusetts and North Carolina) and the District of Columbia have the same chief as they did when the program began, by all accounts, a failure….. The report almost ignores the turmoil surrounding tying teachers performances to the test. Instead as mentioned above, it applauds areas of cooperation and ongoing feedback, including Delaware’s infamous TELL survey… Imagine if that was the only true accomplishment of $4.3 billion and Common Core? It’s worth stressing outside this report that it was evaluations which was perhaps the toughest hurdle many states have faced both internally and with the Education Department. Almost all have argued that tying student test scores to teacher evaluations at the same time that states were shifting to new standards and assessments was misguided. The Department has recently acknowledged this through giving its waivers postponing the implementation of the Accountability piece 2,3,4 years into the future. It takes trained people. And forcing them through constant irrational change-ups to move out of education into other fields, …is something that is not good for America’ s education, …… period. SB 79 was put forth as a protection of student data. Everyone voted for it because who would want child predators to have access to children’s data?….. it passed 17-4 in the Senate. (Lavelle, Pettyjohn, Lopez, Richardson scoring the no votes) and passed 40-0 in the House. An amendment was offered. SS1. Ostensibly to change typos. “deleting certain definitions; and (9) correcting minor typographical errors.” –– Synopsis. The provisions addressing data security and privacy responsibilities currently in code, are deleted immediately, whereas a task force chokes along at turtle’s pace to discuss and develop appropriate safeguards for child privacy. This creates a time gap where data can be shared to anyone with impunity. A normal policy would be to set up a task force designed to make changes and after voting those recommendations, the new law takes over. The old law continues intact until the new one takes hold. Instead, this bill (SS!) gets rid of the “protections” immediately. and sets up a task force to determine what protections our children need. By then, all data has been downloaded to corporate data banks….. It is as if we just let convicted convicts out of prison while investigating human rights abuses alleged to have taken place upon them.. So currently there is no entity guarding your child’s data. Here is what is in the bill. for: The development and improvement of the operator’s Internet website, online or cloud computing service, online application, or mobile application, or other educational Internet websites, online or cloud computing services, online applications, or mobile applications. The words “or other” means your students info is available to anyone. for: to demonstrate the effectiveness of the operator’s products or services, including their marketing. Your child’s data can be freely given to marketers. The provisions of Section 1 of this Act do not apply to projects relating to the privacy and security of student data approved prior to the effective date of this Act...under the Department of Education’s data governance regulation, § 294, Title 14 of the Delaware Administrative Code, in existence on the effective date of this Act. This act does not apply to old regulations it just got rid of. Section 1 of this Act becomes effective on August 1 the first full year following the Act’s enactment into law. Sections 2 through 4 of this Act become effective upon the Act’s enactment into law. There you have it… Section 1 outlines the general privacy planks of the bill it replaced which are not in effect until one full year after signing. Section 2: which annuls all previous protections in Title 14 and is effective immediately. Section 3: establishment of a task force can begin immediately while no protections are in place. Section 4: establishes that if any part of the act is later deemed unconstitutional or replaced by the General Assembly, the rest of the bill still remains intact. In other words, it is severable. This is in effect now. Bottom line: your child’s data is already out there in cyber land, thanks to Dave Sokola and Earl Jacques among others. So how could the General Assembly have been so completely duped? Even the educational watchdogs? Rather easy actually. One has to read the bill with the specific intent of figuring how it will be abused, in order to see it… Since we know the sponsors Sokola and Jacques. We know there had to be something evil in this bill and so we looked at it long and hard to find out how it was constructed and that clued us in where the violation was. What you missed was in the timing, how there would be a gap between opening the gate and closing it… Very clever actually. And all of them were fooled. So sorry parents. Pedophiles (among others) now have your child’s data. It appears the prime motive behind this bill is to allow charter access to explicit private specific data files on public school children so they can be hand-picked, culled, marketed to, and manipulated into signing onto charter schools. That motive would explain this best. But due to the broad nature of this bill it also now allows pedophiles with enough money to buy reports,, the same exact same access to your child’s data at least for this one year.